Venice. 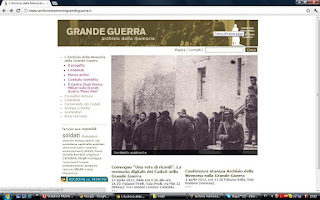 The biggest Great War Italian online archive was launched at the beginning of week. The project, that comes under the supervision of the Centre for Great War Military Studies "Piero Pieri", based in Vittorio Veneto, is presented today during the press conference at the seat of the Council of Regione del Veneto by the Director of the Centre "Piero Piero", Colonel Lorenzo Cadeddu. Basically we are in front of a crowd-sourced project made possible only thanks to the close cooperation between researchers and families. The cooperation with families in sharing photos, memorabilia and other uncommon documents was essential for the success of this "grassroot" initiative, that now aims to become also the starting point for a new reliable digital archive of the casualties of the Great War. Of course the future developments of this archive will need a growing cooperation, in order to release a complete archive at the end of the centenary timeframe, in 2018. The Great War in Italy was concentrated in North-East part of the country, namely in the regions of Trentino-Alto Adige, Friuli Venezia-Giulia and Veneto. The three municipalities of Vittorio Veneto, Nervesa della Battaglia and San Donà di Piave gave a precious contribution in the start-up stage of this initiative; hopefully the scientific commiteee and the staff working on it will obtain new support from other municipalities of the Venice area. The come up of the First World War centenary represents at the same time the goal and the challenge of this new digital initiative in the long term. The purpose and ambition are of course to release, by the end of 2018, a supervised crowd-sourced archive, to be considered as a precious memory by the future generations, not only in Italy. Here and beside, permanently in the "Pontoon Bridges" section, the link to the website.